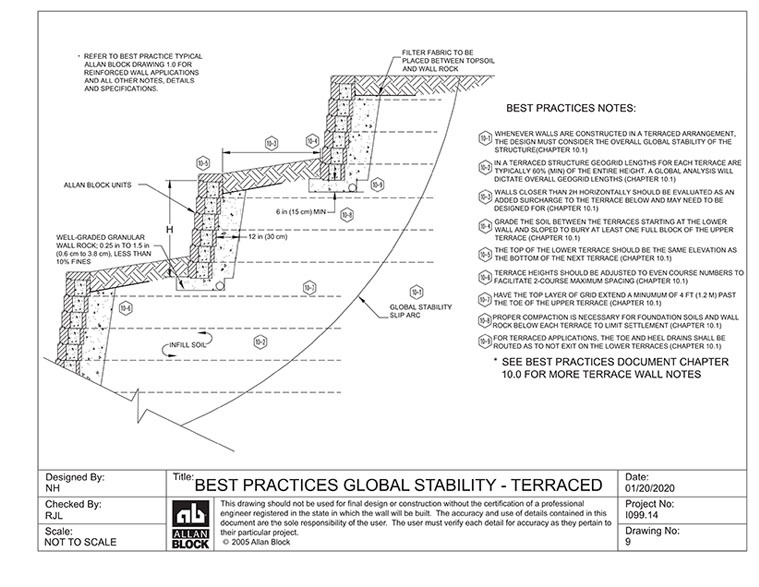 10.1 Whenever walls are constructed in a terraced arrangement, or any of the other conditions listed, the designer must consider the overall global stability of the structure. When determining the surcharge applied from the upper wall onto the lower wall, it is common to consider the walls as independent if they are spaced apart a minimum of twice the height of the lower wall. 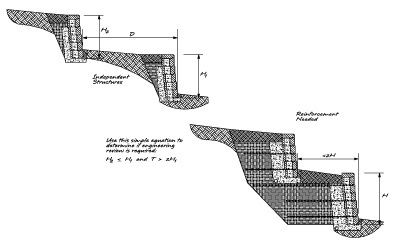 If they are spaced closer, the lower wall must be designed to carry the surcharge of the upper wall(s), Figure 10-1. These recommendations do not eliminate the need to consider a global stability analysis. Greater attention to compaction should be placed on the foundation soils below the upper terraces and in transition areas where the wall splits from one wall into two. If the soils are not properly compacted in these areas, settlement can occur over time that could cause aesthetic concerns.